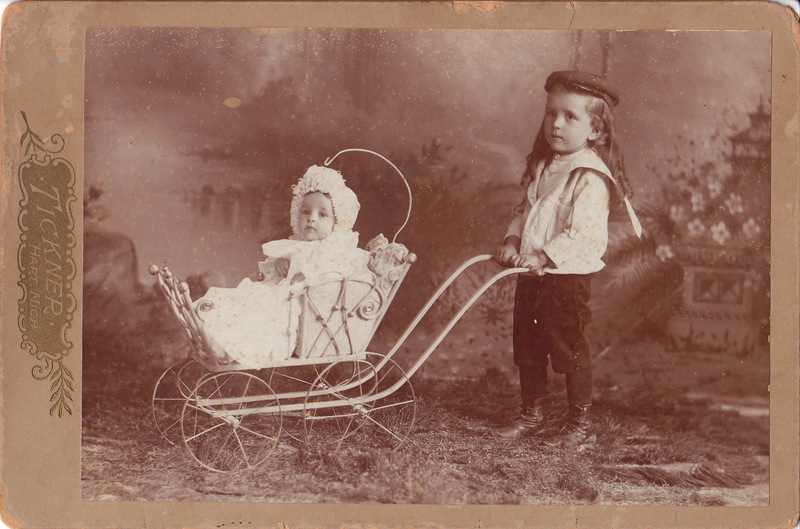 A young Russell Smith pushes an even younger, Edna Collins, in a baby carriage (the kids names are noted on the reverse of the image). The two children are very cute. Russell has flowing long hair and a wonderful cap. Edna looks adorable in her gown and bonnet. The baby buggy is quite ornate. To view other baby buggies, click on the category, “Baby Carriage”. The photographer is Albert G. Tickner and his studio was located in Hart, Michigan. According to the United States census of 1910, Tickner (1872-?) was born in Ohio. At the time of the census, he was a 38 year-old photographer and proprietor of his own business. He was widowed and lived with his four sons (ages spanned between four and fifteen) in Hart, Michigan. Research yielded no information about Russell Smith; but the search for biographical material about Edna Collins was more fruitful. The 1920 census discloses that there was an Edna Collins living in Hart. Edna was twenty years-old and was a public school teacher. She lived with her father (Sodorous) and her mother (Carrie). Her father was a druggist and operated his own store. My goodness look at the curls on that little boy! And love his pantaloons! Interesting how they took a picture of two children with different last names, perhaps they were cousins? I was wondering the same thing, how these children with different last names had their pictures taken together. I agree that cousins is a likely option. It may also have been possible that the notes on the back were written later, and that Collins was the girl’s married name, but that doesn’t seem to be the case here.